Japanese ceramics are beloved by connoisseurs as some of the finest in the world. There is an almost endless variety of forms and styles, which can be confusing until you realize that each evolved individually in different parts of Japan. If you want to understand the craft of pottery in Japan, or to see some of the most unique examples, there’s no substitute to visiting one of the many ceramic towns, which are spread out across the archipelago. We have put together a list of 6 of the best Japanese ceramic towns where you can see historic craft in action, buy some one-of-a-kind ceramic art, and even roll up your sleeves and give it a go yourself. So read on for some unmissable suggestions! In Tochigi Prefecture, just two and a half hours north of Tokyo by train (see on Google Maps), is where you’ll find Mashiko, arguably one of the nation’s most famous pottery hubs. Although the creative achievements of the area go way beyond pottery and include painting and other traditional crafts, ceramics is the main drawcard. Known as Mashiko-ware or Mashiko-yaki (yaki means fired), the appeal of the area’s pottery lies in its authentic, rustic feel; thick in structure and simple in design, this local pottery looks and feels like it’s been made to stand the test of time. There have been pieces of pottery found in the area dating all the way back to the Jomon Period (14,000-600 BCE), but you can trace the modern history of Mashiko pottery to the mid-1800s when it was said that a man by the name of Keizaburo Otsuka noticed the quality of the healthy red clay here and set up a local kiln. The demand from nearby Tokyo for the everyday-use ceramics boomed in the early 1900s, and by 1924 Shoji Hamada, a famous potter, set up a workshop to meet demand. Today you can learn all about the history of the city’s relationship with pottery by visiting the Shoji Hamada Memorial Mashiko Sankokan Museum, the Mashiko Museum of Ceramic Art as well as coming face to face with the contemporary ceramic scene at the Mashiko Pottery Cooperative Selling Center. If you don’t get a chance to make it out of Tokyo, don't worry, there are plenty of places in the city to explore Japanese ceramics. Check out the 5 Best Places to Buy Ceramics in Tokyo. Probably the one town most synonymous with world-class Japanese ceramics, Arita sits in western Saga Prefecture (see on Google Maps) and is generally known as the hub of where porcelain was first produced in Japan over 400 years ago. The local pottery style is known as Arita-ware, Imari-ware or Imari-yaki. Its relationship with pottery began when kaolin, a clay mineral that’s an essential component of making porcelain, was found buried in the local mountainside. As craftsmen from Korea were brought to the area to share their knowledge of ceramics the local pottery economy boomed, and it’s why you’ll see that many of the pieces from this area feature Chinese- and Korean-influenced design aesthetics. Because this local type of porcelain was far more durable than the more crumbly pottery of the area, it became an incredibly valuable source of income and identity for the area of Arita. One well-known kiln that has been in operation for over 200 years is the Arita Porcelain Lab. You can find out more about this forward-thinking company in our interview at The Future of Japanese Pottery: Arita Porcelain Lab. Today it’s impossible to visit the town without stumbling upon monuments dedicated to the craft; in the village of Okawachiyama (see on Google Maps), even the town map is made from porcelain. If you’re planning on visiting to learn more about the craft, be sure to visit this village, located just outside of the central Imari area: it’s a small semi-isolated village dedicated to the craft. You will find an incredible concentration of ceramic kilns with beautiful handmade pieces at all price levels. Other highlights include Tozan Shrine in Arita, famous for its porcelain torii gate, the Arita Ceramic Museum, the Kyushu Ceramic Museum, and the nearby center of Imari where you’ll find the porcelain Koimari Clock. In the art-loving pocket of Okayama Prefecture is where you’ll find Inbe (see on Google Maps), a small village that spawned a very unique type of pottery simply known as Bizen-ware or Bizen-yaki. Named after the province in which it was created, this much sought-after ceramic style is typically made from a either a really rough earthy, iron rich clay, or a combination of different clays with different densities creating a much more textual product. Bizen-yaki is said to have a history that dates back over 1,000 years, which is pretty incredible; however what’s more interesting about this unique type of ceramic is its claimed supernatural powers. Locals have believed for centuries that food eaten off Bizen plates and sake sipped out of Bizen cups tastes better, also flowers held in Bizen vases are said to last longer. A scientist tested the claims and it turns out that Bizen pottery actually cut out 90% of far-infrared rays, keeping natural materials fresh, meaning the claims could actually be true. If you make it to Okayama prefecture, be sure to stop by Bizen to learn more about this fascinating form of pottery. You can visit the Bizen-yaki Museum or try to make your own Bizen-style pottery, by signing up for a class at the local pottery school. If you’re headed to nearby Kyoto, you might want to check out these 5 Best Places to Buy Ceramics in Kyoto. Heading on over to the island of Shikoku, you’ll find a far more delicate style of pottery known as Tobe-ware or Tobe-yaki. Not far from the larger city of Ehime (see on Google Maps), Tobe pottery came into existence after the locals realised that the neighbouring mountainside was a very fertile ground for producing some excellent pottery-style clay. 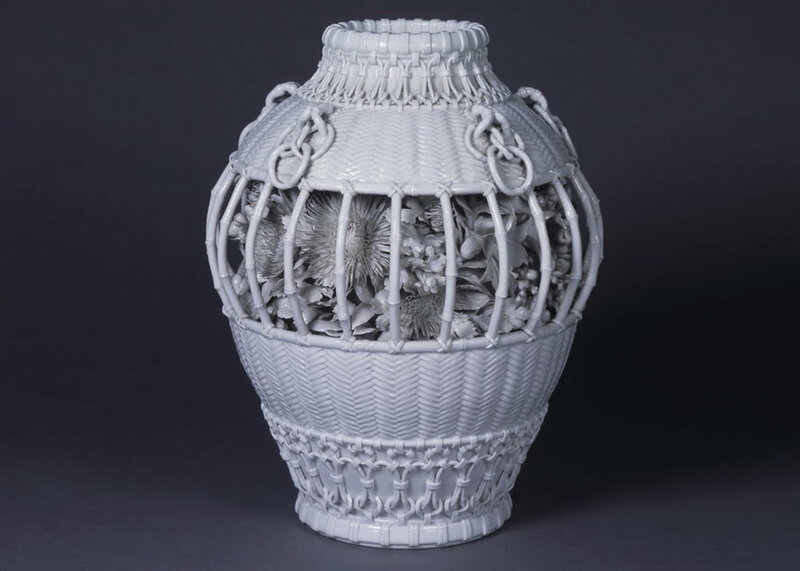 With a history that goes back almost 250 years, it’s a little more low-key in terms of reputation and reach than some of its other ceramic contemporaries, but still a very fascinating version of the craft. Tobe-yaki’s most distinctive element is its decoration. Typically painted with indigo, and occasionally red and green paints, some describe the style as more ‘feminine’ than other rustic versions of everyday Japanese pottery. You’ll typically find Tobe pottery in the form of bowls for sanuki udon noodles, and as decorative vases. To show off their ceramic talents, the town hosts a Tobe-Yaki Ware Festival twice a year, in the spring and fall. During these events around 60 stall holders set up shop in the heart of Tobe showcasing the best of their work. Your next chance to enjoy the festival will be the weekend of October 20-21, 2018. On the tropical islands of Okinawa is a style of pottery quite unlike anywhere else in the world. Situated in the Nakagami District, on the central island of Okinawa is Yomitan (see on Google Maps), a quaint village populated by a ramshackle cluster of kilns and pottery houses producing a local strain of ceramics known as Tsuboya pottery. In the 16th and 17th centuries, this unique type of unglazed pottery boomed in popularity after a trio of Korean potters came to the Okinawa city of Naha to practice their craft. It's said that after a while the locals got frustrated with the smoke billowing out from the kilns, so they were moved further out to the Yomitan peninsula, which is where you’ll find the heart of the craft very much being kept alive today. Like much of Okinawa’s other artistic forms, the stylistic influence of Tsuboya pottery comes from a variety of sources. There’s Chinese and Korean influence as well as a strong lean towards the lavish Ryukyu Kingdom style of aesthetics, heavy in intricate detail. Like a block of silky white tofu in ceramic form, there’s something almost too perfect about Izushi ceramics, which is what makes it so fascinating. Born in the Izushi District of Hyogo Prefecture (see on Google Maps), Izushi-ware is fired using a material known as Kakitani pottery stone, and it’s this material that gives it its pure whiteness. Positioned about three hours north-west of Kyoto, the town of Izushi itself is a rather humble, yet fascinating castle town well worth visiting if you’re interested in experiencing a truly untouched pocket of Japan filled with unique history and culture. It is the site of Eiraku Kabuki Theatre, the oldest working kabuki theatre in the Kansai Area, and is said to be the home of soba noodles. 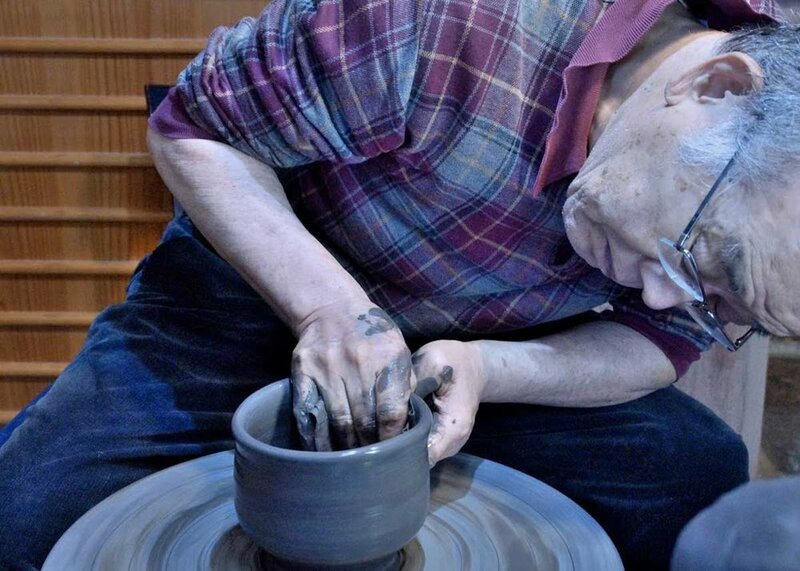 To help encourage foreign tourism and share their ceramic legacy, Izushi regularly holds ceramic classes and experiences where you can get your hands dirty. For inspiration, you may want to find out about Japan’s 11 Best Female Ceramic Artists, or these 5 Extraordinary Japanese Tea Bowls! Have you visited any of these ceramic towns? Let us know what you thought in the comments below!